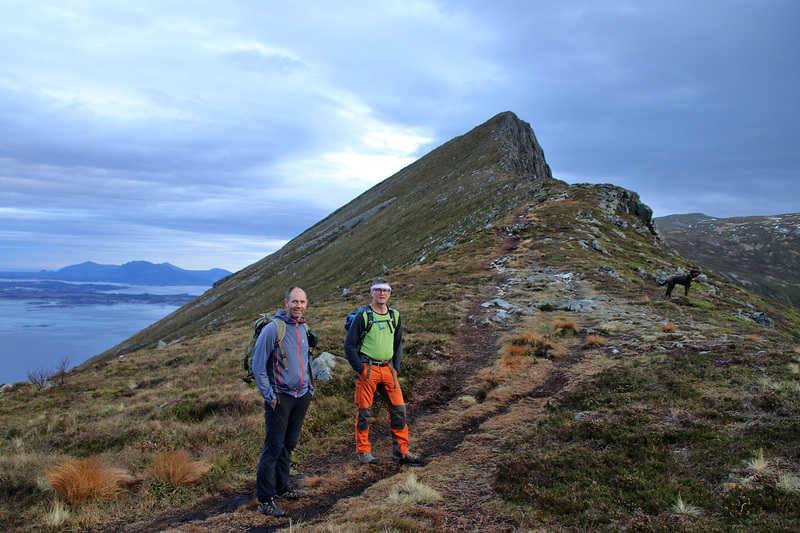 For the second year in a row, I went on a trip with my friends Trond Gran Andreassen and Kjetil Svenkerud, in memory of our late and good friend Arngeir Syversen. 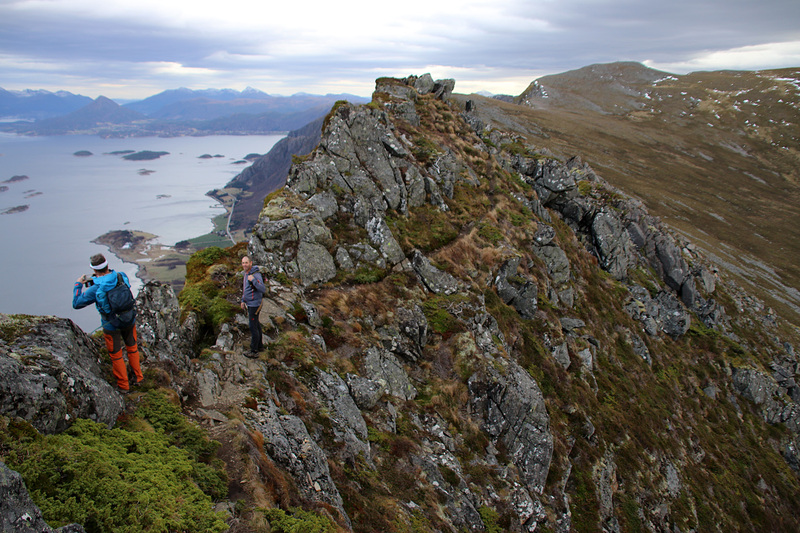 Last year’s trip went to Skarrabben in the Sunnmøre alps, and that was also our target area this year. 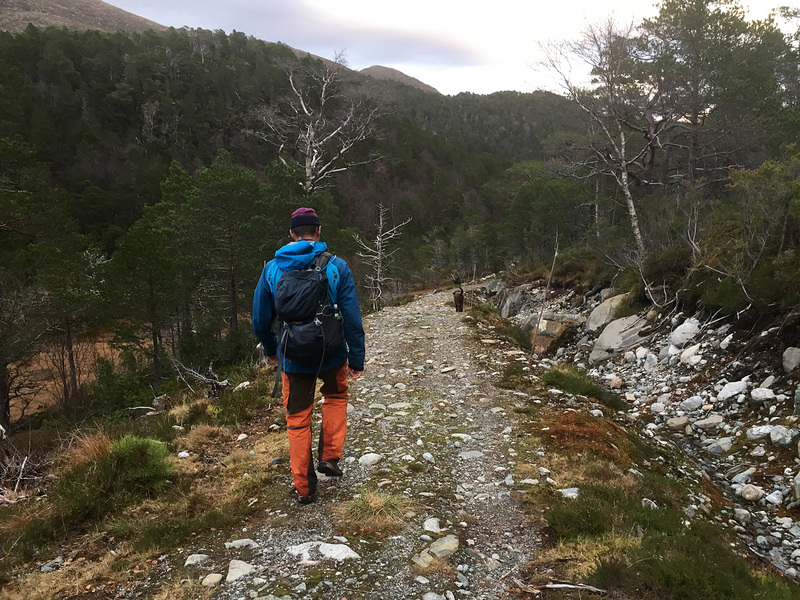 But due to the general weather this weekend, we decided to look for an alternative trip, and as Kjetil hadn’t done any tops in the Midsund region yet, I took a good look at the map. What I found was a cool route across Rørsethornet, Ræstadhornet, Grøtet, Oppstadhornet and Heggdalshornet. 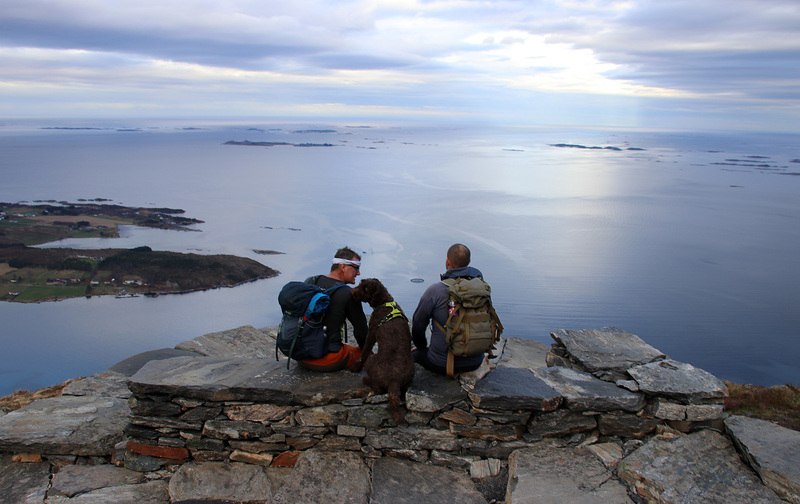 I had been to all of these tops previously, so in order to see something new, I proposed to stop by Foksåta. 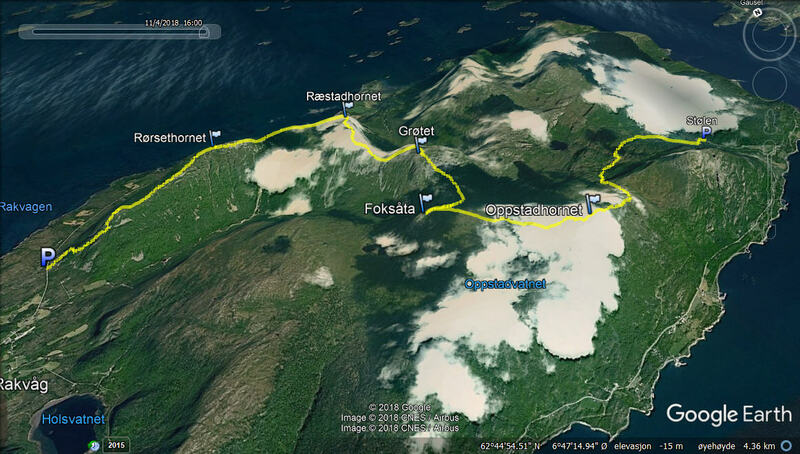 In addition, the Sherpa path up to Rørsethornet did not exist when I did that walk on Nov 4 2007 – on the day 11 years ago! First, we drove to Nord-Heggdal and left Trond’s car there. Then we drove my car to Vågsmyran on the other side of the island. 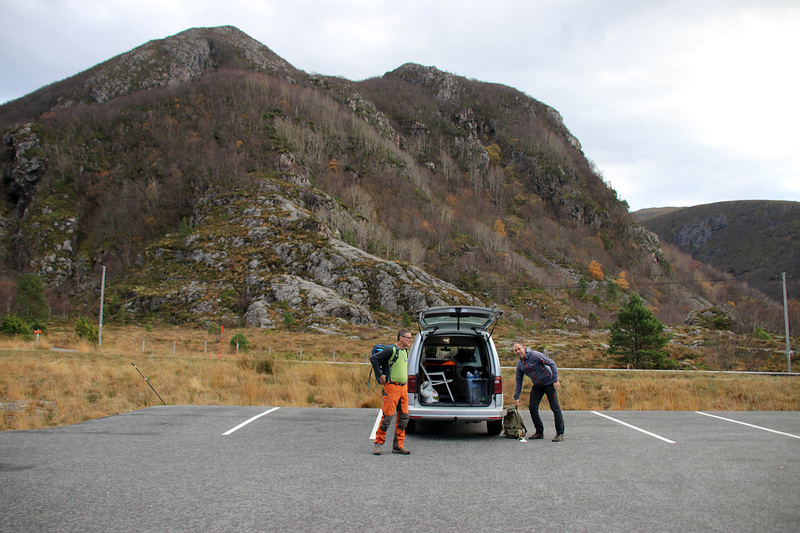 The Rørsethornet trailhead was easy to find and they have created a nice parking area there. Ready for a long and nice hike! Walking up the Sherpa steps was big fun. I know there are different opinions on this. Mine is crystal clear. Every mountain region can “afford” a path like this. It is the go-to place on sunny and rainy days, and the grumpy people have miles and miles of unspoiled terrain to seek peace and harmony in. 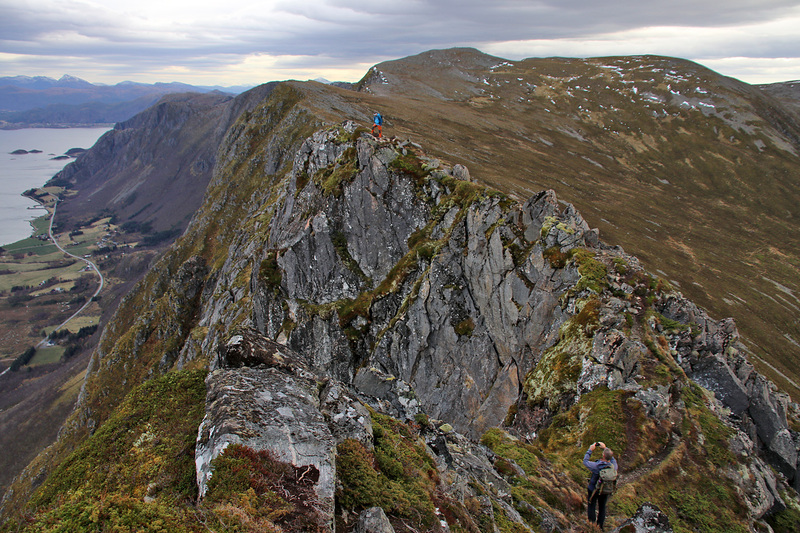 And for sure, more people will hike Rørsethornet than ever before. So for the public health – superb! 4 in total. Definitely 4! The Sherpa path ends up on the ridge. 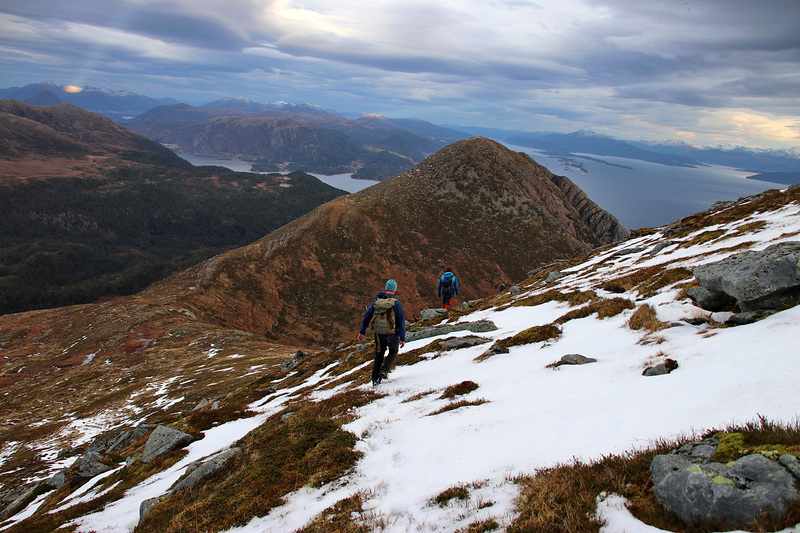 The final walk to Rørsethornet is along a good old fashioned mountain path. It was nice to be back on Rørsethornet. One top down. Several more to go, and we could see most of our route from up here. 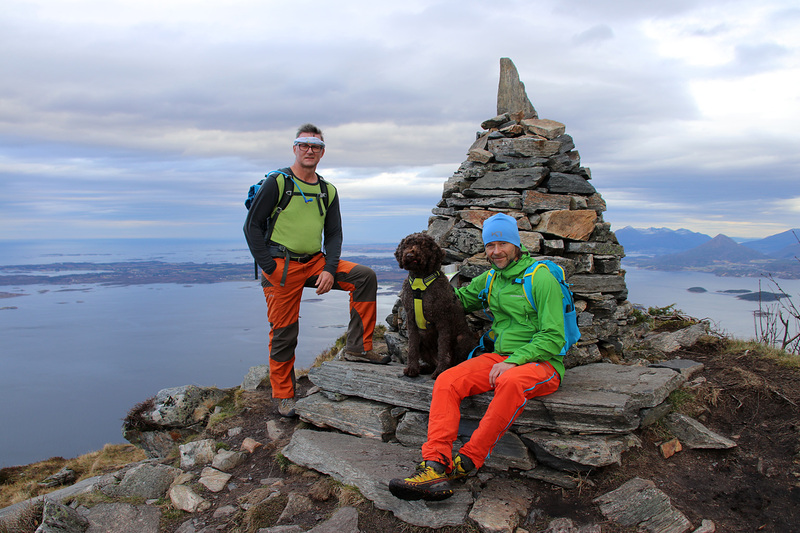 Trond, Karma and me on Rørsethornet. 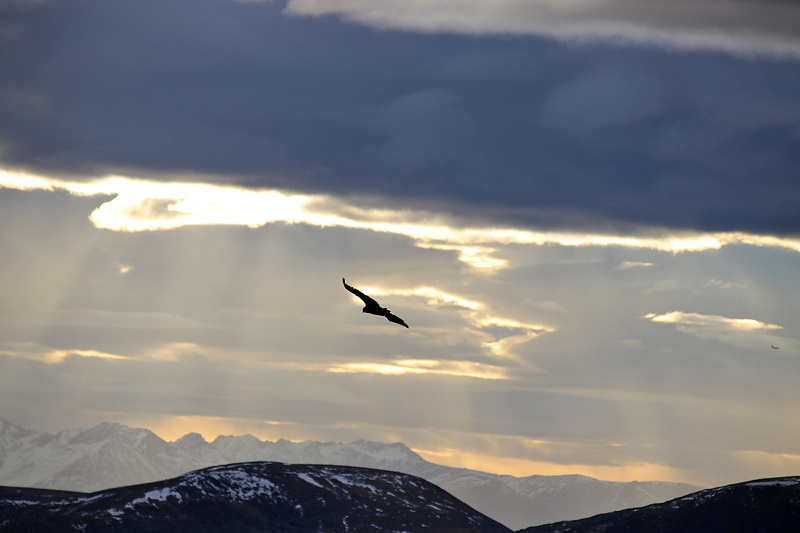 Photo by Kjetil. 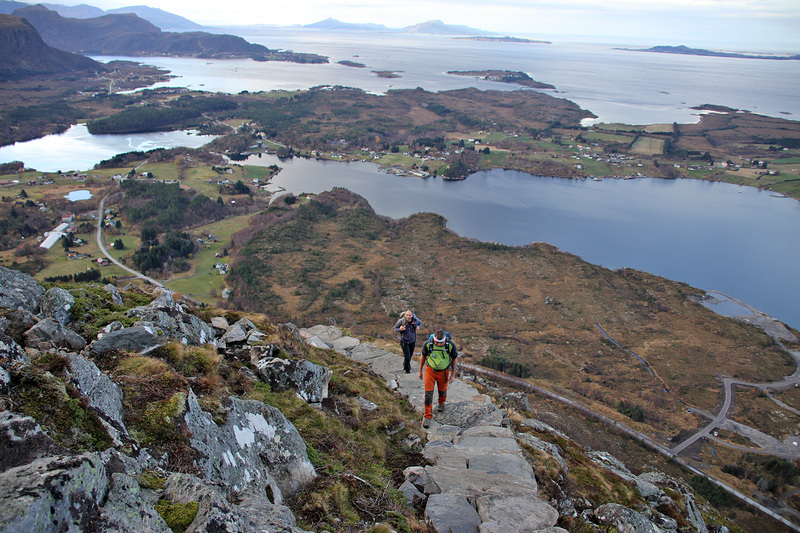 In order to get to Ræstadhornet, one has to walk along a very visible, but narrow ridge path. Sadly enough, there was a recent fatal accident here, but there is absolutely no reason to fear this route. Just take it slow and easy, enjoy the amazing terrain and – don’t stumble. 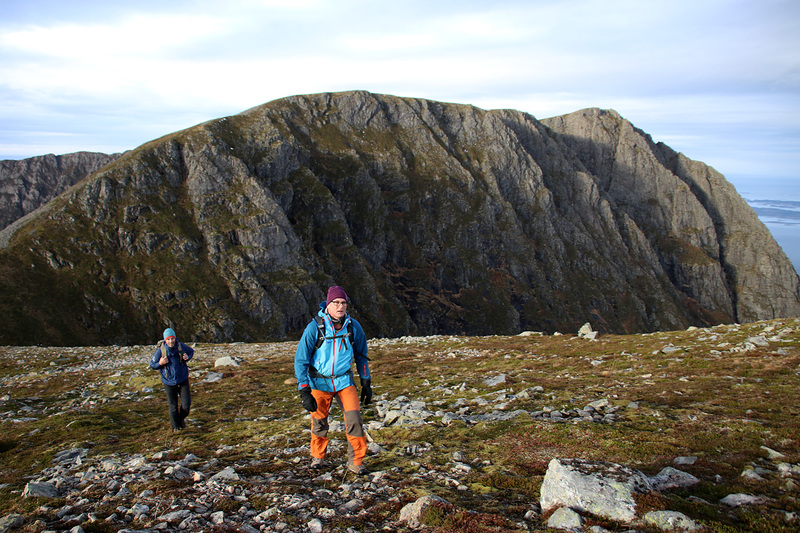 Next up was Grøtet – a slightly dull and anonymous top between the eastern and western tops on this island. 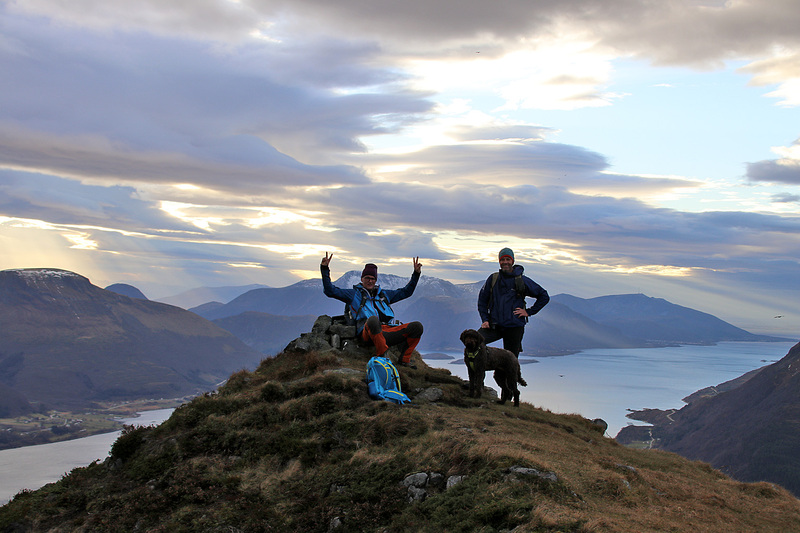 In other words, it was just a place we had to cross, but Kjetil and Trond could “tick off” a new top in their CV. 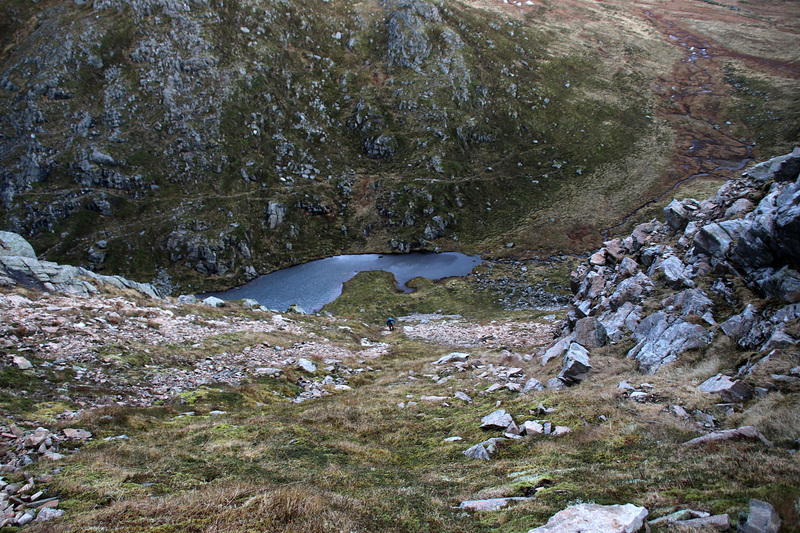 From Grøtet, we descended to a small lake and then had a somewhat steep ascent up to Foksåta. The group was slightly scattered now, but we all reunited on the top. First time here for all of us. 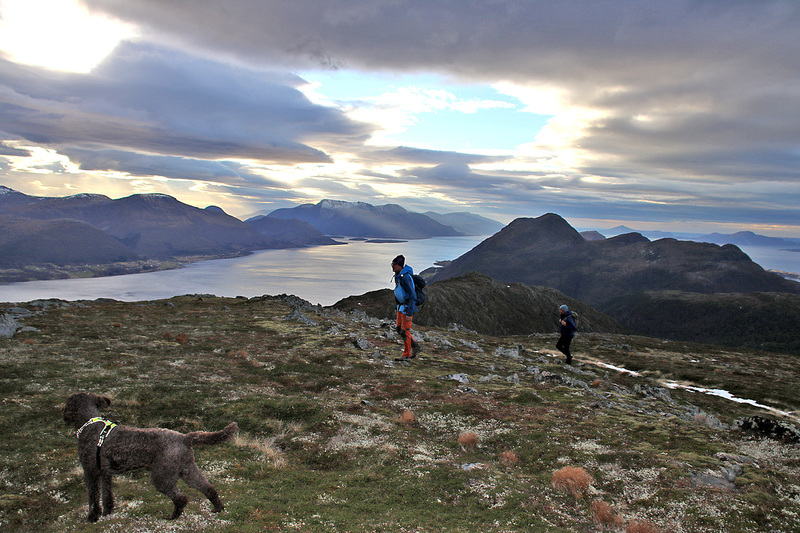 From Foksåta, we had a nice walk over to Oppstadhornet – which is the highest top on Otrøya island. This was my 3rd visit to Oppstadhornet. 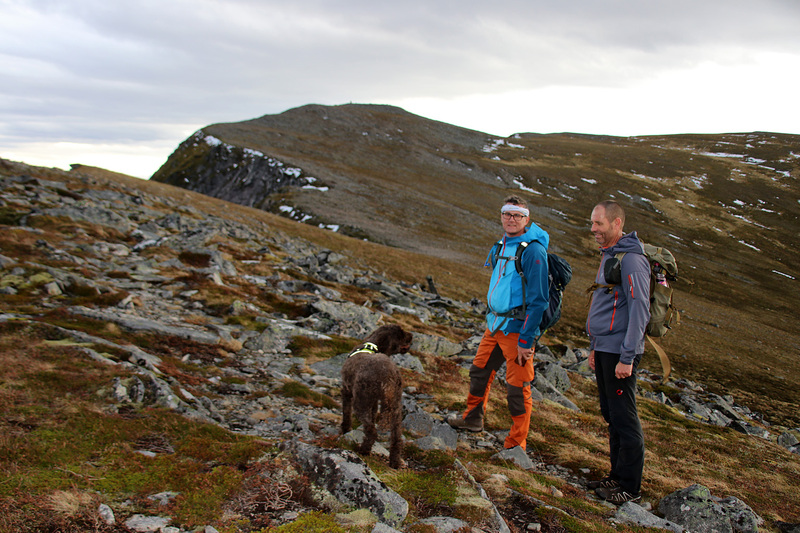 The previous trips were together with my good friends Torill Berg and Petter Bjørstad, back in 2007 and 2008. It was nice to be back! So we decided to take the shortest route down to the forest, which included some off-trail walking. But eventually, we got on a tractor road that led us down to Trond’s car at Stølen. 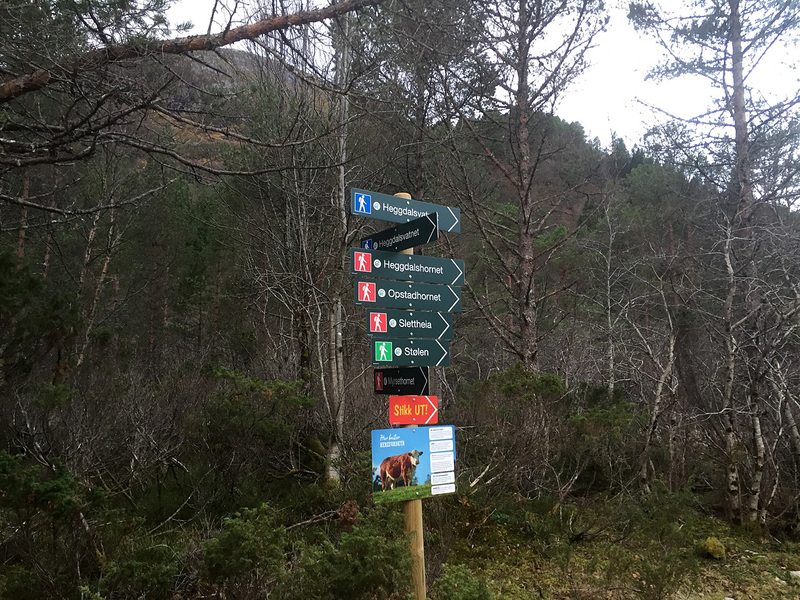 Interestingly enough, 200m before Stølen, we found a bunch of signposts, but we hadn’t seen a single stick or marker when we headed down from Oppstadhornet. My opinion on this, is that if you put up a signposts, you got to follow up with markers. Otherwise, what’s the point. “That way!” just doesn’t cut it, if you ask me. In our local trail group, we put up the markers first and THEN supply the signposts to tie the route together. Spektaculære udsigter!!! Helt fantastisk tur!!! Det kunne være interessant at se jeres rute på app: Komoot -højdeprofilen på turen.